At Bill’s Auto, we go the extra mile to make your experience with us as convenient and pleasant as possible. We have free loaner cars so you do not have to be without a car for the day. This is great if you work or need to run some errands while your car is being serviced. Instead of making arrangements with a friend or family member to borrow their car, borrow ours, free of charge. For those of you who do not need a car for the day, but do need a ride home or to work, we have a free shuttle service available. When your car is ready, we can pick you up, free of charge. 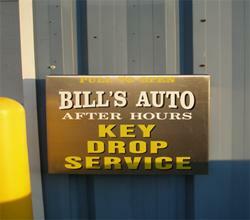 If the best time to drop off a car to get worked on is after hours, we have the solution, an after hours key drop. Inside the key drop box, we provide an envelope to fill out and put your keys and important papers into. Then just drop it in the security slot and we will contact you as soon as possible.